The past two weeks have been really busy at work so when I got home in the evening all I wanted to do was sit on the couch and read simple books that didn’t require any thinking. Not surprising that I didn’t get much sewing done. On top of that, the things I tried to do weren’t all that successful because I ended up having to unpick most of what I did. When a period like that lasts too long I get frustrated at not getting anything crafty accomplished. Yesterday I decided that it was time to satisfy my crafty urge and since my current projects weren’t working I knew I needed to start something new. I decided to make a pillow case. Not that I really needed another one, but it’s a simple project that can be completed in a short amount of time that stills offers plenty of opportunity for customisation. 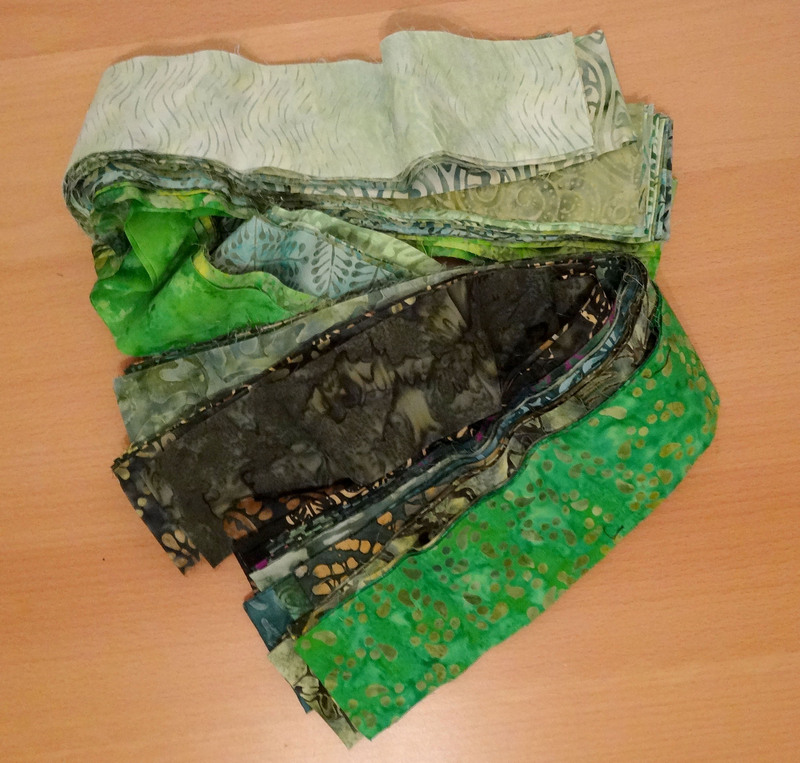 When I looked for fabrics to use I came across this set of lovely green batik strips (Bali Garden from Keepsake Quilting). A couple of months ago Claudette from tabbyonthepatio offered this set in a giveaway because she had two and only needed one. I thought this was very generous and I was lucky enough to win the giveaway! As it turned out precut strips of fabric were just the thing I needed yesterday. 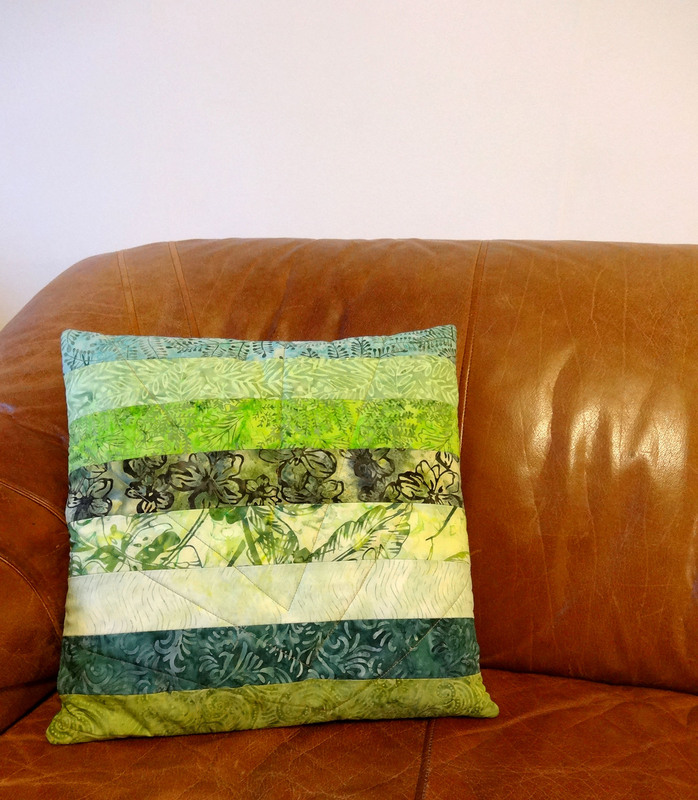 I could play a bit with colour, mindlessly sew the strips together, do some simple straight line quilting, handsew some binding, et voila, I had a new pillow for our couch. I decided to make an envelope closure so I didn’t have to bother with zippers. I also didn’t want to bother with matching any seams so I put the strips on the front horizontally and the ones in the back vertically (you can’t see this in the picture). The pillow didn’t turn out completely as planned because I originally wanted to use only 3 strips for the top flap of the closure but had already sewn 4 strips together before I knew what had happened so the closure is now in the middle of the back. I had also intended the quilting of the top and bottom of the back to sort of work together as one design and then sewed the binding strip to the wrong side of the top piece so it is now installed upside down. Ah well, I think it still looks pretty good and the quilting isn’t that noticeable. I still have quite a bit of strips left so perhaps I’ll turn those into a matching quilt someday. 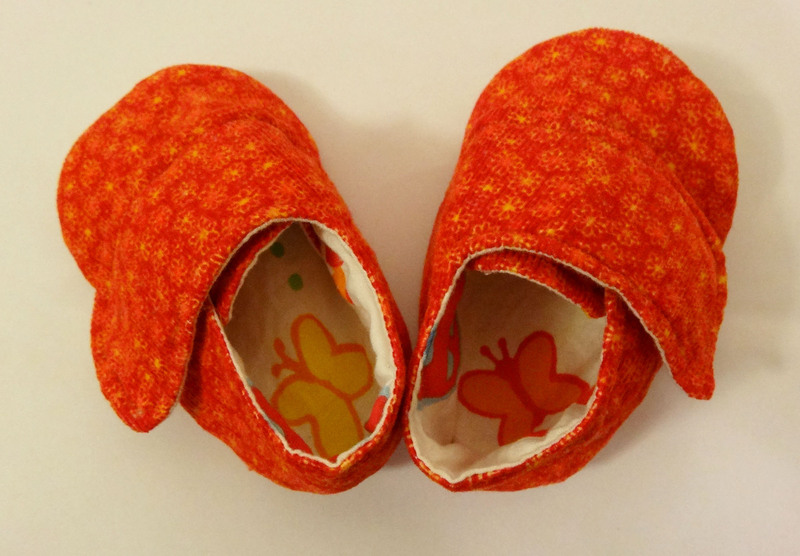 After making the Samantha women’s shoes for myself I wanted to try another of the ithinksew designs and made these cute Cameron baby sneakers for a colleague’s new-born daughter. 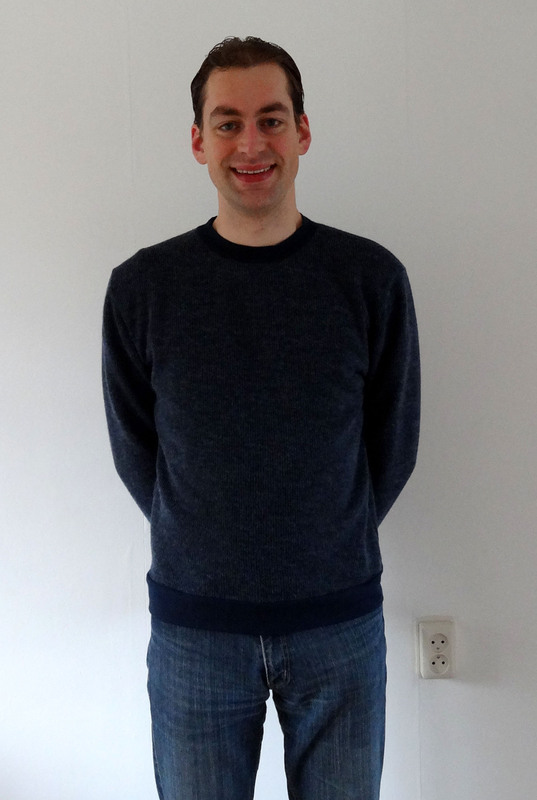 The sneakers come in 5 sizes and I made size 3, which should correspond to 6-9 months. 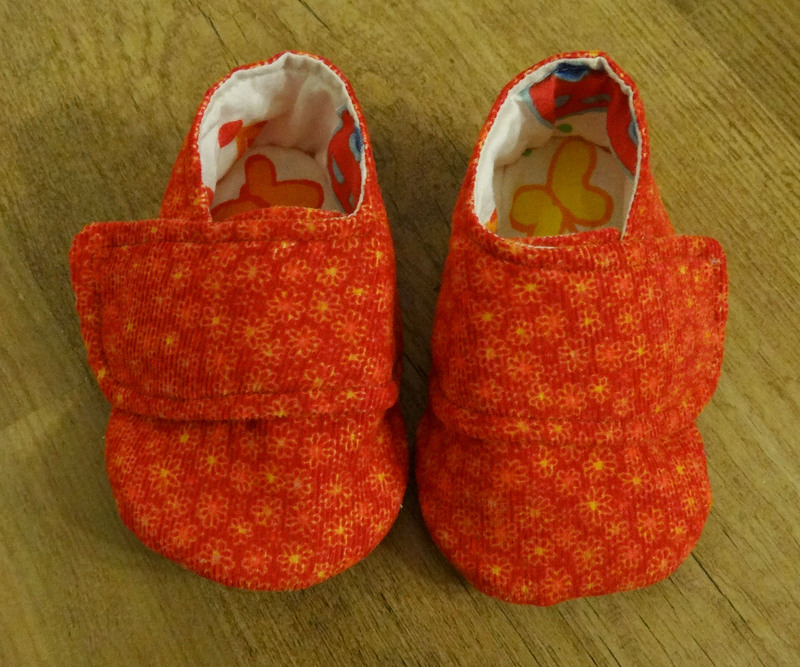 I am glad I didn’t pick the smallest size because sewing these shoes was much fiddlier than the ones I made for myself. Add in some fusible fleece that didn’t want to fuse (any tips anyone?) and it did take me longer to finish these than I had initially expected. It was still a pretty fast make though as I finished them in less than an afternoon. 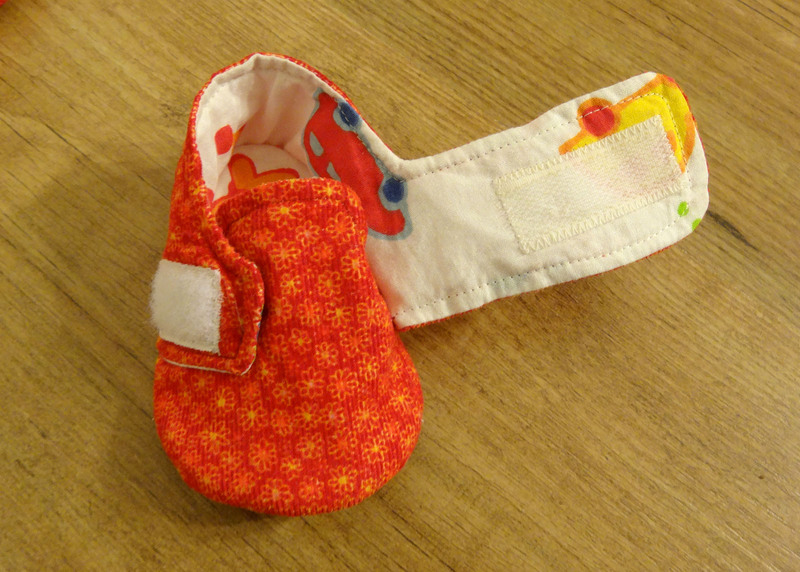 For the outside I used a red with yellow flower print baby rib and for the lining an Ikea kids fabric. 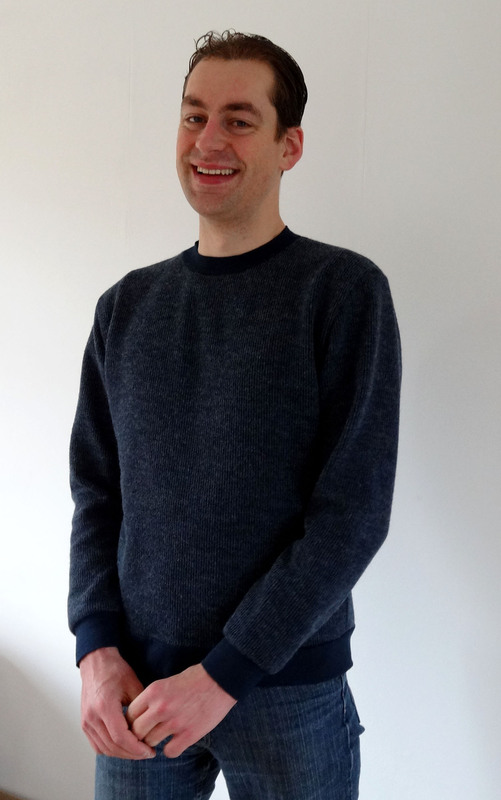 The outside layer was interfaced with fusible fleece to provide warmth. For the sole I used red slipper grippers. 6-9 month old babies probably don’t really need anti slip on their shoes yet but I figured “better safe than sorry”. The pattern provides a placement marking for a snap closure but I thought velcro would be a better choice since that is easier to close and makes it possible to adjust how tight the shoes are closed. I do wonder though how easy it will be for the child to kick them off. 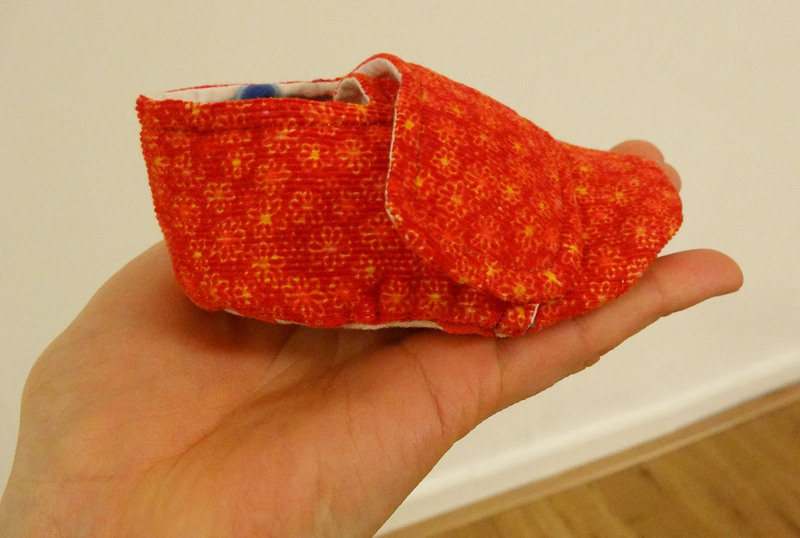 I might make these sneakers again, but then I think I will go for the largest size (12-18 months) to make the sewing and turning right side out a bit easier. When I looked up the pattern so I could link to it I saw that ithinksew has a sale until the 15th so if you were already interested in any of their patterns now would be a good time to get it. Of course now I am also tempted to try another one…. First of all I would like to wish all my readers a very happy new year! I hope 2014 will bring you more than you expect. This year promises to be a busy one for me as I intend to finish this thing called a PhD thesis so that I can defend it in 2015. I also want to spend plenty of time crafting though as I find that this helps to keep me sane and happy. 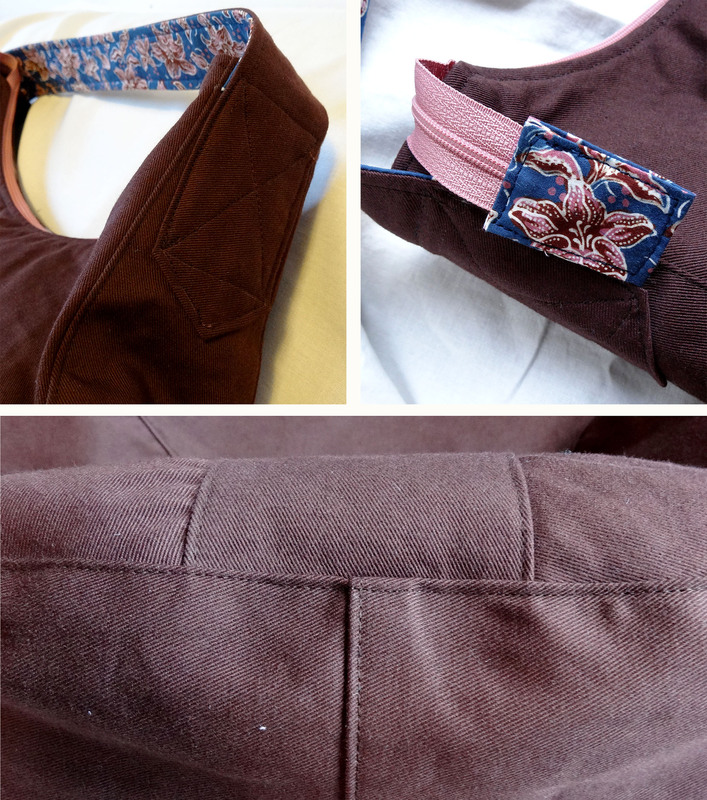 I was lucky enough to be one of the pattern testers for SeamstressErin’s first pattern, the Presidio Purse. This was my first time testing a pattern and I thoroughly enjoyed it. Usually I make my own pattern when I want to make a bag and then I mostly use rectangles, so it was fun to make a bag that has some curves to it. Erin describes this bag as an oversized hobo style handbag and it certainly is huge. It is the largest bag I have ever made and you can stuff almost infinite amounts into it, like Hermione Granger’s bag in the last of the Harry Potter books. In December I spend two nights out of town to visit a conference and this bag was all I took and it was nowhere near full. The bag is carried over the shoulder and has a top opening zipper. 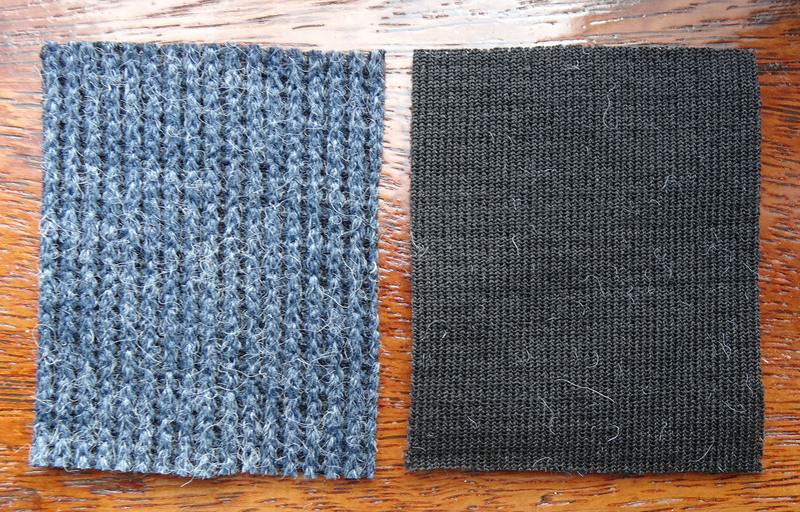 The front has two options for insets and there are also two options for the shoulder strap, with and without D-rings. 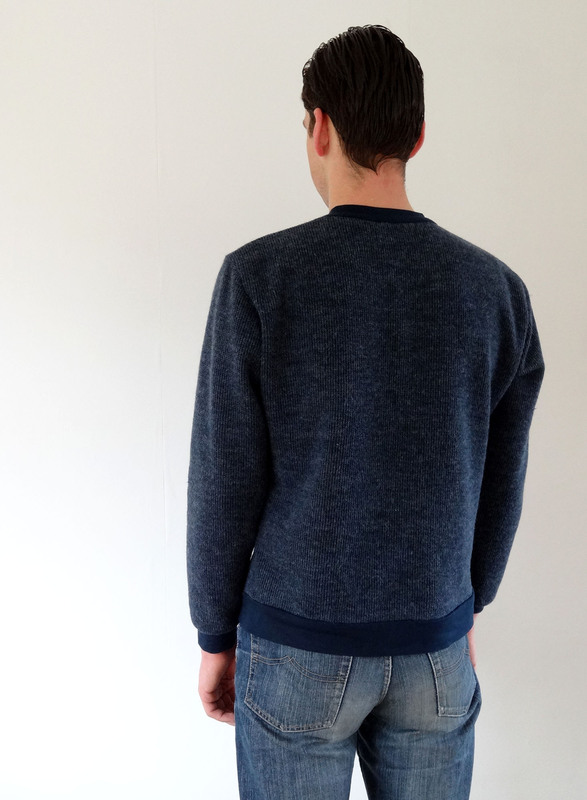 On the inside there are two pockets, one with a zipper and one patch pocket that is divided into 3 separate pockets. The pattern comes as a PDF, so you have to do some assembling before you can start sewing but I think it took me less than 30 minutes to piece the sheets together and cut the pattern pieces out of the paper. Alternatively, you can take the printshop version to a printshop and have them print it for you on one large piece of paper and avoid assembling. The 1/2” seam allowance is already included in the pattern. I’m not really a fan of a 1/2” seam allowance because it doesn’t translate as well to a metric measurement as 3/8” or 5/8” but I had no problems assembling this bag and I can’t remember unpicking anything during the construction. The instructions in the test version were already clear enough for me to make this bag without issues but in the final version they’ve become even better, Erin clearly took all our advice to heart. I really like the drawings that illustrate the more challenging construction steps. Because there is a bit of time pressure when you’re testing a pattern I decided to just get started as soon as possible and use materials from my stash instead of going fabric shopping. For the outside I used left-over fabric from my living room curtains that I interfaced with medium weight fusible woven interfacing (according to the sewing instructions I didn’t need to interface but I did it anyway because I don’t like floppy bags, call me a rebel). For the lining I used an Indonesian batik that was a gift from my mother. I am glad I was finally able to use it in a project and I think it works very well with the curtain fabric and the pink zippers. I also used it for the bottom of the handle and the zipper tab because I wanted to add some additional interest to the exterior. 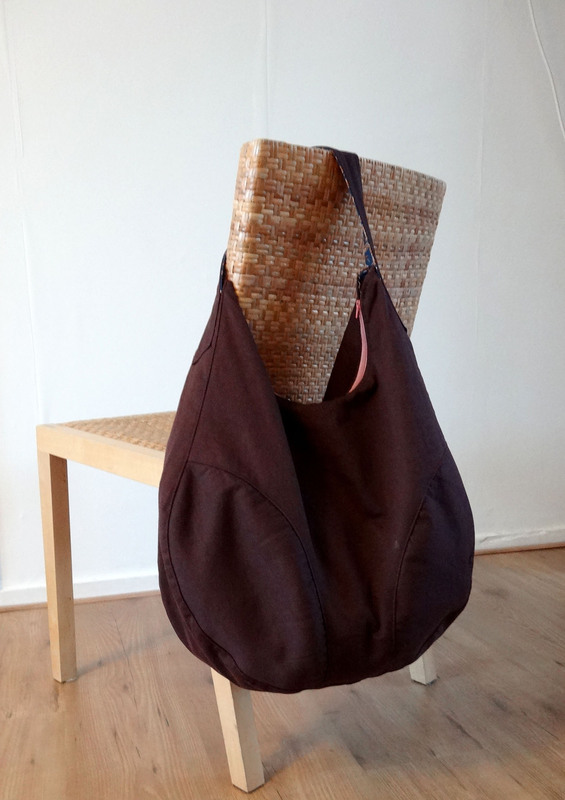 If you want to dip your toes into bag making this bag might be just the ticket because Erin is going to host a sew along on her blog so you’ll be able to follow each construction step and ask questions along the way. She will also show some extra options that are not included in the pattern such as how to add piping and extra pockets. 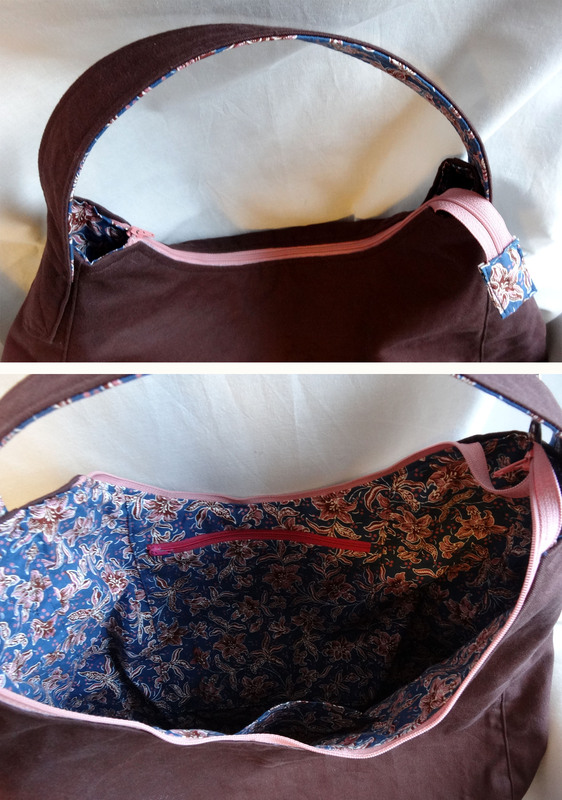 I plan to make another version for myself with an adjustable shoulder strap and more pockets. I prefer to carry my bags across my body because that way they stay put when I cycle at top speed. I know some people are going to laugh about this because I’m not very fast, but hey, I meant my top speed, so stop laughing! I’d also like to play a bit with the insets because I think those offer a great opportunity for customisation. Erin released the pattern for this bag today so if you want to know even more, please hop over to Erin’s blog!